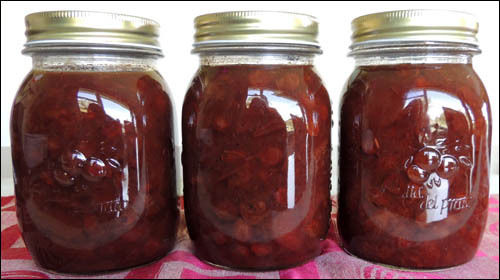 Combine plums, onions, raisins, sultanas, garlic, brown sugar, salt, mixed spice and habanero in a preserving pan. Add enough malt vinegar to almost cover and stir well. Bring to the boil and simmer gently with frequent stirring for 2 hours, or until the chutney as thickened to a jam-like consistency. Pack into sterilised jars and seal while hot. This will make enough for 6 x 350 ml jars. Unopened, this chutney will keep for up to 1 year. Once opened, store in the fridge. 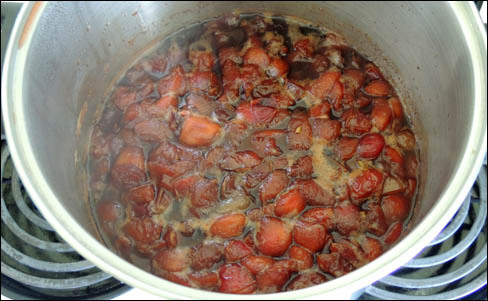 Adapted from the recipe for Fruit Chutney, published in ‘Edmonds Chutneys, Pestos, Jams & Other preserves, (2000), p. 12. Finely chop the oregano and the coriander, (until the moisture in the leaves is starting to ooze out). Neatly dice the capsicum and chop the onion finely. Toast the ground cumin in a medium saucepan for 1 – 2 minutes (until aromatic). Add the onion, vinegar, sugar, oregano, habanero and salt, and bring to boiling point. Simmer for about 5 minutes. 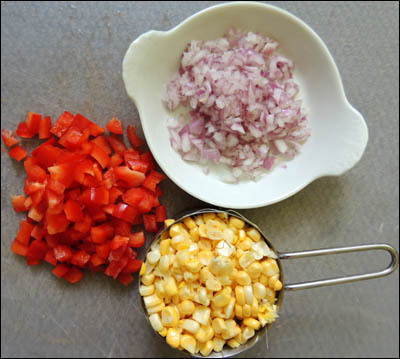 Add the capsicum and corn, and simmer for a further 3 – 4 minutes, or until the corn is cooked through. Pour into hot sterilised jars and preserve using the water bath method. Adapted from the recipe for ‘Cilantro Corn Relish’ from About.Com Home Cooking. The beautiful vermillion-flowering gum, Corymbia ficifolia is in full bloom along our fence-line. Every time I catch sight of it I am amazed by the blaze of colour it produces. The days leading in to Christmas and the New Year were filled with all the tasks associated with having 13 family members arrive for Christmas dinner. This involved a large amount of cooking and tidying up, right from when we knocked off work on December 20th. It’s only now that I feel I can relax a little and enjoy the remaining 5 days of my summer holidays. The early Summer weather has been extremely changeable – very warm and humid, with summer showers on most days. Not the gentle kind, but rather, heavy downpours that move on as quickly as they have arrived. This time last year we were experiencing the beginnings of a drought that lasted for several months. The rain may be annoying on days when we want to lie in the sun or take a dip in the pool, but it’s been amazing for the garden. With all the vegetables and fruit ripening around us, I’ve been itching to fill our shelves with preserves. We tend to freeze a lot of produce, but there’s nothing quite as satisfying as cooking up a range of jams, sauces, chutneys and pickles. I didn’t do anything about this last year, but was determined to not waste any scrap of food if I could help it, this year. I had come across reference to electric water baths for preserving produce, and this seemed a much better alternative to that of boiling jars in a big preserving pan on the stove top. I searched and searched online to see if such an appliance could be purchased from anywhere in New Zealand, to no avail. In the end, I had to spread my net wider and look to our neighbours across the Tasman for this very desirable piece of equipment. We ordered a Kensington Food Preserver from Ozfarmer just prior to Christmas, and it arrived within the week. This was surprisingly good service, given the distance and the fact that it was the Christmas period – a time when the mail service is already disrupted. I have now used the preserver three times! It’s so much easier to just load it up with my filled jars, turn it on, set the temperature, then leave it for the requisite amount of time. I’ve been startled at the cost of the preserving jars and lids, however! Since Christmas I’ve made batches of Plum Sauce, Plum Chutney, Corn Relish and Zucchini Pickle. 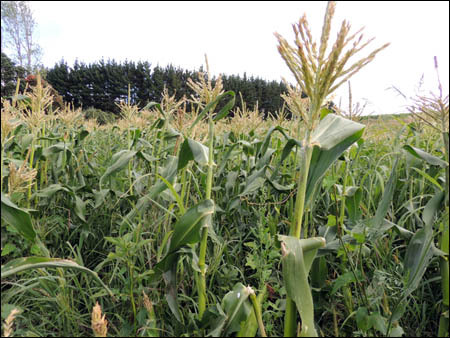 Our back paddock is rented by one of our neighbours (David) and used to grow sweet corn for the Christmas market. What usually happens is that the pickers come through prior to Christmas to harvest the best and fattest ears, after which we are allowed to literally ‘help ourselves’. Last year we froze several kilograms of corn, which lasted us well into the winter. We scrape the kernels off the cobs and freeze them free-flow. Yesterday, Ben picked 85 ears and plans to pick at least the same amount tomorrow. Fortunately, a sunny day is forecast, as I like to think that our solar panels are producing lovely free power while we are boiling away water on the stove to blanch the kernels. I took the above photo earlier this evening – it was around 7.00 pm with the sun low in the sky to the west. The amount of weeds growing up around the corn can be seen, but these are mostly grasses. David has been experimenting with reducing his use of weed killers this year, which has relieved me greatly. There is now a good deal of overseas data published to alert us to the issues around the ongoing use of glyphosate. Glyphosate is commonly used in New Zealand to ‘clean up’ pasture prior to planting crops and resistance to glyphosate has now been observed in New Zealand, as well. 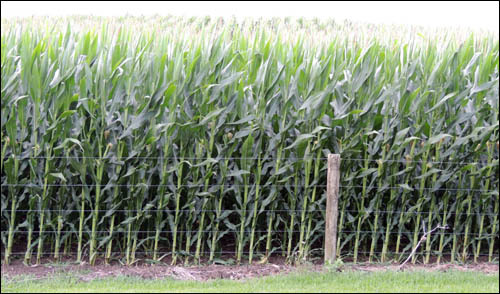 Maize growing over our fence. Across the road there is a dairy farm, but our 3 acres is surrounded on all the other sides by fields of maize. This year the maize seems to have grown incredibly tall and is so densely-planted that you can barely walk between the rows. The maize won’t be harvested until April, by which time the kernels will have dried to the colour of rich gold. Leila, Lottie and Lulu are a bit slow on the uptake. When Ben threw them some cobs of corn that had been scraped, they just looked at them suspiciously. 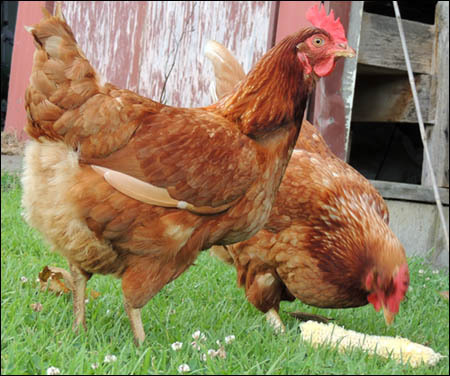 It was some time before one of the hens decided to stab a cob with a tentative peck. Even now, they aren’t that keen – unlike our previous three girls. 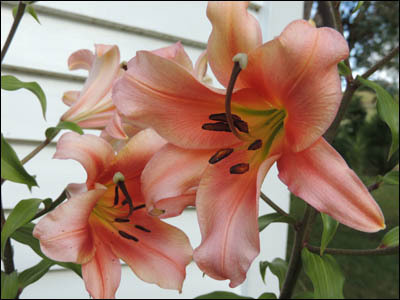 My beautiful lily Oriental Lily Gluhwein is flowering is the moment. I planted the bulb a couple of years ago, and this year the plant has produced two very full stalks of flowers, despite the paucity of rain recently. This morning we went for an excursion to a farm near Helensville to purchase some fresh, full-cream milk. For a small fee, we were able to join up with a cooperative which means that we will be able to obtain fresh, unpasteurised milk, almost straight from the cows. I’ve made soft cheeses before, using milk purchased from the supermarket, but it’s not that easy to find full cream milk in this day and age of trim and ultra-trim milk. And everything I’ve read about making cheese tells me that the best milk to use is that sourced directly from a farm. We embarked on our 70 km round trip at around 8.00 am, allowing time for brunch at The Cafe in Helensville and for the purchase of a 4 litre stainless steel milk can from RD1. The agreed rendezvous was a dairy shed at the end of a dusty, gravel road, and we arrived right on time at 10.00 am. I’m not sure what I expected, but there were quite a few people there ahead of us, carrying receptacles of various sizes and chatting amongst themselves. The fresh milk is stored in a huge gleaming stainless steel tank. Once you have joined the cooperative, it works on an honesty-box system. We are able to turn up on any day between 9.00 and 11.00 am to purchase milk and/or any of the small range of other dairy products available, e.g. yoghurt, heavy cream, light cream or cream cheese. We purchased 4 litres of the fresh milk, plus a jar of the heavy cream (for our Christmas Pudding on Wednesday). And I’m definitely keen to buy some of the yoghurt, as it has been made using Caspian Sea culture. This is a serial culturer, which means I can use the yoghurt to start new batches over and over again, and it’s one of the few yoghurts that will culture at room temperature. 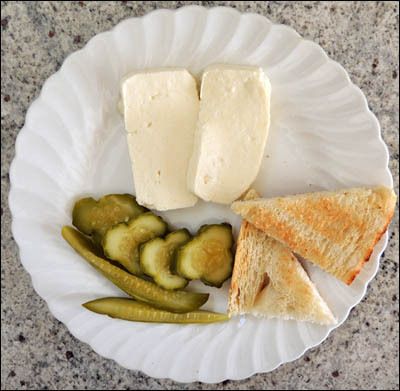 When we arrived home, I used 1.5 litres of the milk to make a simple curd cheese. 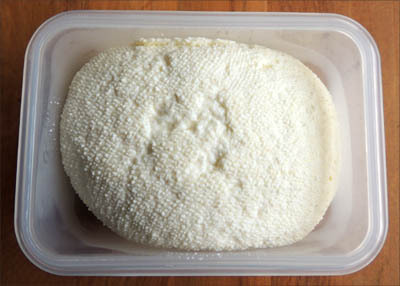 The result is a soft, white cheese which can be used for sweet or savoury dishes. My 1.5 litres produced 352 grams of the cheese. 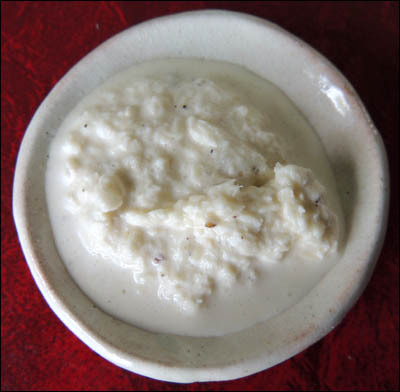 Once it has drained through muslin, the curd forms a soft creamy ball which can be crumbled, sliced or cut into cubes, depending on what you wish to use if for. You can also blend it with a little sugar and vanilla or cinnamon for a dessert cheese. I added salt to today’s batch as I wanted a savoury cheese. Our afternoon tea comprised of some toasted, freshly-baked Italian bread, sliced gherkins (from last week’s batch) and some of this lovely fresh cheese. 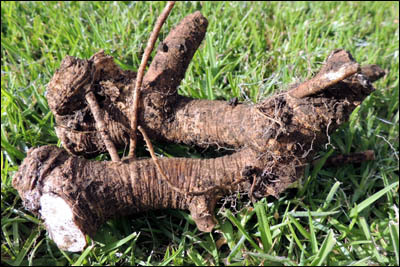 Later in the day, Ben dug up some horseradish roots (Armoracia rusticana) to prepare Horseradish Cream. The plant itself looks quite a bit like a dock plant, and the roots are very long and stretch deeply into the soil. Fresh horseradish is grated finely and mixed with fresh cream, lemon juice or vinegar, a pinch of sugar, then seasoned with a little salt and pepper. Horseradish is a member of the brassicaceae family, which includes cabbages, wasabi, and mustard – it has a very strong (hot) flavour and Horseradish Cream is very popular in Finland, where it’s called Piparjuurikerma. Horseradish is also a traditional accompaniment to Gefilte Fish. Our horseradish has been in the same spot in the vegetable garden for about three years now, and is growing very densely. The slightest piece of root will start a new plant, so you need to take care not to put trimmings in the compost heap! At some stage we’ll need to move the plants out of the vegetable garden to a more suitable site. One of the many gardening tasks for ‘later on’. 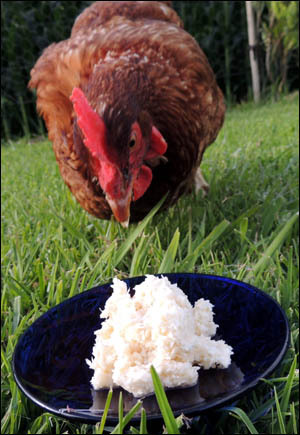 Apparently hens like horseradish, too! Lottie ate a good proportion of this pile while Ben was trying to photograph it. Afterwards, she cleaned her beak, and seemed non-affected. I’m not sure what her egg will taste like tomorrow, though, and it should get rid of any worms! 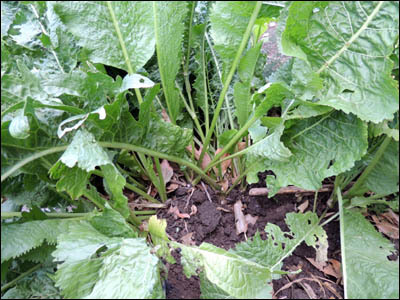 As well as being a vermifuge, horseradish is great for clearing the sinuses and also has anti-bacterial properties. There is some interesting other information about horseradish on this page Lilith’s Apothecary. I really value having horseradish in our garden. Heat the milk to boiling point in a stainless steel pan. Remove from heat and add the lemon juice. 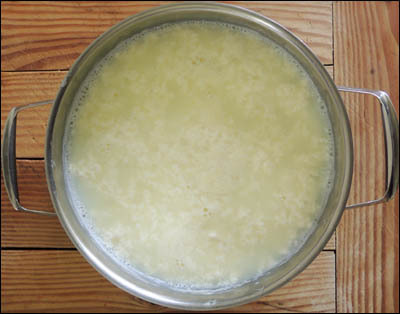 Move the liquid very slowly with a plastic or wooden spoon, until a curd begins to form. The curds will start to cling together. Leave for about 5 minutes, then pour through a colander or sieve lined with muslin or cheese-cloth. Ensure that the colander/sieve is sitting over another pan or a bowl to collect the whey. Tie the neck of the cloth and hang the cheese from the tap so that it can drain into the sink. In about 10 minutes all of the whey will have drained off, and the remaining curd can be turned into a storage container. At this stage salt can be added to taste. You can see the pattern from the cheese-cloth on the cheese I made today. This cheese should be stored in the refrigerator and eaten within a few days. It’s great for savoury or sweet dishes. e.g. cheesecakes, as a base for dips, creamed for a dessert topping, sliced or crumbled into salads, etc. Rain was forecast for this morning, but it bypassed South Head altogether. I had decided to water the flower garden at dusk last night, which proved a sensible choice. There are clouds scooting across the sky as I write, and out the window I can see the neighbour across the road riding his farm bike across the paddock. There were black and white cows there last night, but they’ve moved on today. 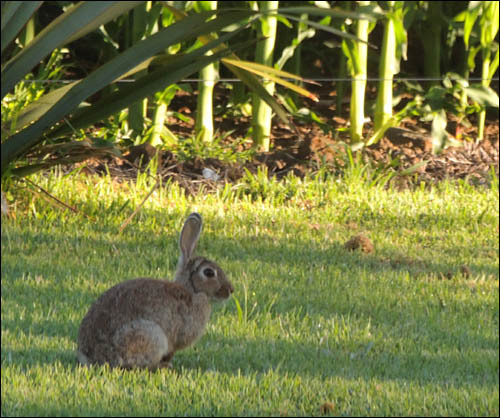 We had an unwelcome visitor this morning, in the form of a wild rabbit. Not that a pet rabbit would be any more welcome. I’ve seen him a few times lately and hope that he doesn’t make a habit of visiting us, or of bringing his extended family with him! Outside I can hear ‘kihikihi-wawā’ cicadas (Amphipsalta zealandica), named for their loud chorus in the summer months. And there is a new tui hanging around – I’ll call her a ‘she’ although she could just as well be a male. She sings with just the one repetitive call – a sort of sharp ‘qweel’ sound with the first note dropping off to a lower note, not unlike the sound of a squeaking gate. She started calling this morning at around 5.30 am, right outside the bedroom window. I wonder if she’s looking for a mate as she is usually alone, which is uncommon for the tuis around here. She looks too fat to be a juvenile bird. 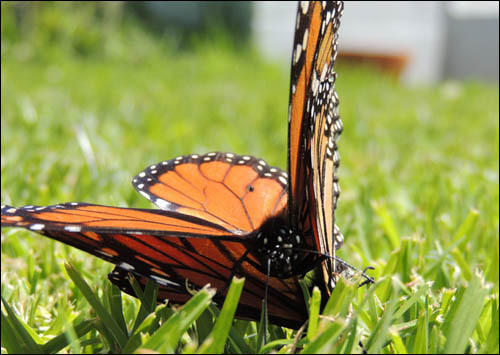 On my garden ’rounds’ this afternoon, I spotted a couple of monarch butterflies, coupling on the grass. Then they actually flew away (not sure how), soaring upwards and disappearing over the top of the trees. High on love, I guess. 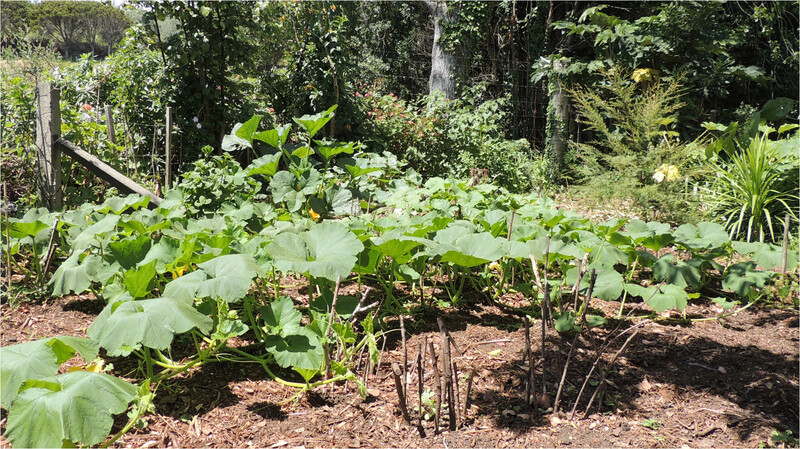 When I got to the pumpkin patch I was distraught to discover that the hens had scratched up some of our freshly-sprouted melon seedlings. The baby plants had been fenced-in with sturdy sticks, but these had been knocked down, and all that remains is a dusty hollow amongst the wood-chips. The hens are such little monkeys! I had to physically remove Lottie three times or she’d have destroyed several runners on the gherkin vine. Just the one gherkin ready today, but many more on the way. I know that once they really start ripening I’ll be busy pickling every other day. 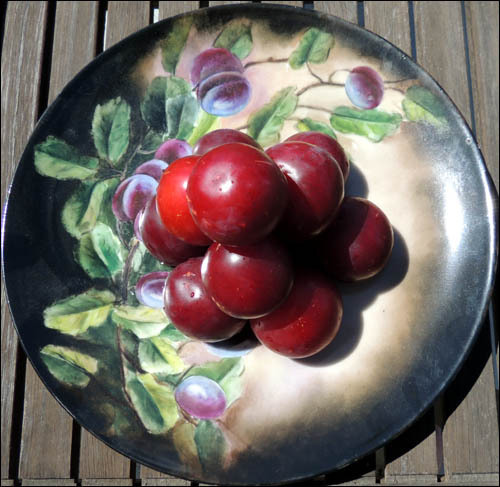 The best remaining plums are either on the other side of the southern fence or at the top of the tree, so we walked around to the back paddock with a ladder to collect a bowl full. 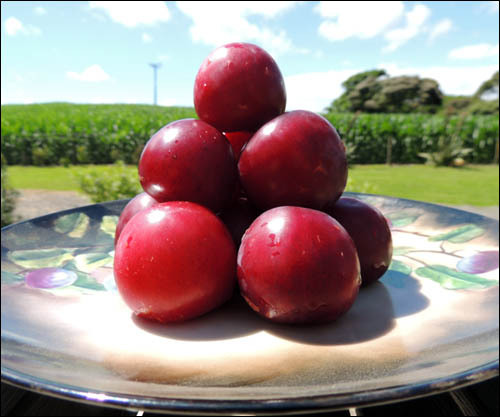 Ben will make a plum cake this evening for dessert. I searched on the internet last night to see if I could find a stockist in New Zealand of electric water bath preservers, but without success. This seems to me the perfect appliance, with all our fruit and vegetables and just the two of us here. I can smell the plum cake cooking. Yum! Towards the sunlight and up and over the old tree stump. Beat sugar and butter until fluffy. Mix baking powder with flour and sift into creamed mixture. Beat in eggs and salt. Mix everything well. Pour mixture into a large greased baking dish and smooth out with a palette knife. The mixture should be about 2-2.5 cm deep. 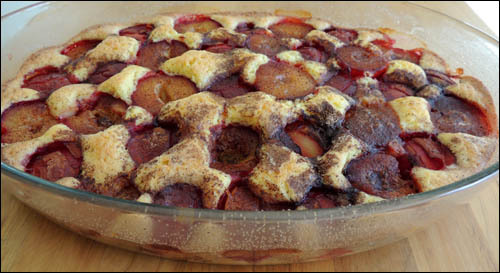 Top with the 24 plum halves, alternate with cut side up. Then sprinkle with the sugar/cinnamon mixture. Bake in a pre-heated oven on the lowest shelf for about 45 minutes, or until a skewer comes out clean. Cool to room temperature or serve warm. It is simple and really delicious. 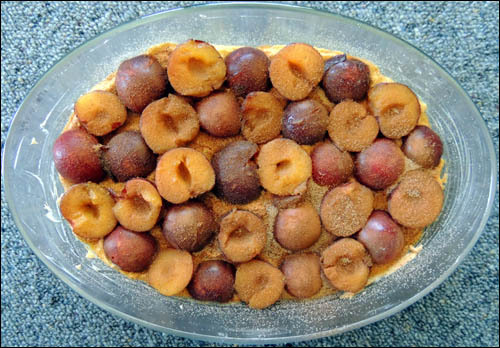 It works just as well with frozen plums, which is why we’ve been freezing so many plum halves over the past few days. It was as I expected. 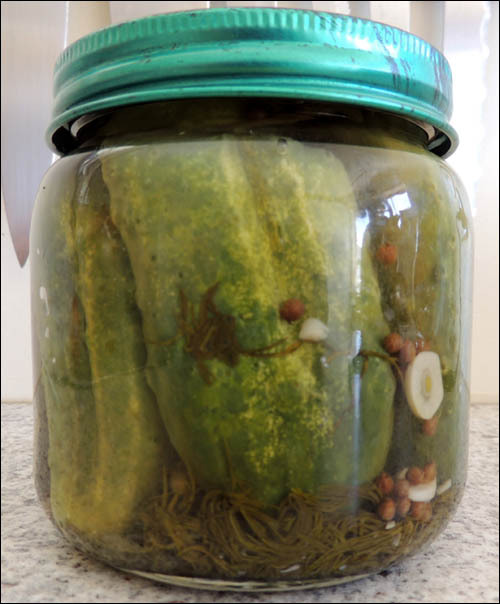 When I braved the heat yesterday afternoon, I discovered that the plants in the pumpkin patch have put on a huge amount of growth and there were 6 gherkins big enough for pickling. The two days I’d been away had been hot, dry and sunny. Weeds are rampant and most of the plums have ripened and dropped (or been eaten or frozen). It’s actually too hot to stay out in the sun for too long in the middle of the day. I spent about 15 minutes trying to weed around parts of the vegetable garden, but it felt like the heat was pushing down on me as a physical force. I tried a new gherkin recipe yesterday afternoon. You can sample them after a minimum of 3-5 days, although of course, ideally they should be left for at least a month for the full flavour to develop. If this recipe tastes good, I’ll use it for any more that are produced. It has no added sugar, which will suit my taste buds much better than the sweet gherkin recipe I tried a couple of years ago. 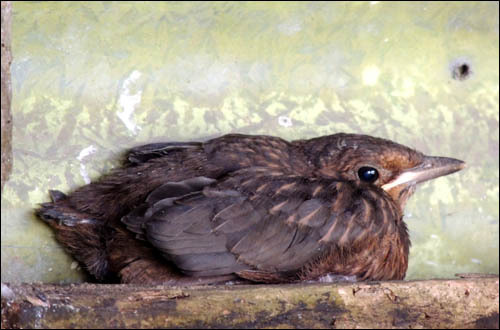 In the barn, the four blackbird chicks have left the nest. We could see three last night – two perched on the washing line and one huddled down on a ledge. Earlier today I could only see one chick. It was standing on the woodpile, staring solemnly at me, and not moving. 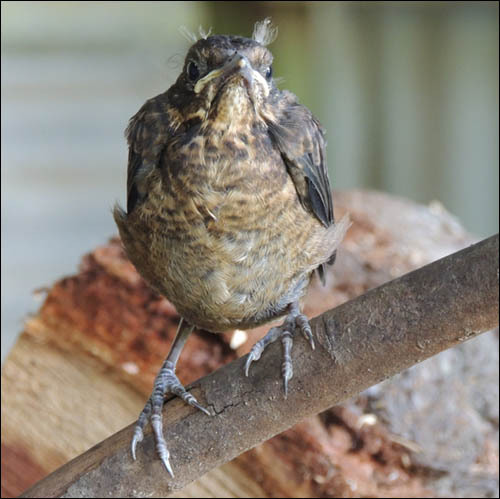 When I left the barn, the blackbird hen flew to it with a beak full of worms. Currently we have the following herbs and vegetables in the garden ready for eating: asparagus, basil, beetroot, coriander, dill, lettuces, silver beet and zucchini. The climbing beans are on the point of being ready, as are the strawberries, and our tomatoes are tiny and green. But now that the fruit has formed, eating them is not far away. Wash gherkins thoroughly and dry. Cover them with salt in a sealed plastic bag and set aside for 3-5 hours. Mix the vinegar and water in a pan, and heat. Add garlic (thinly sliced), bay leaf, dill and coriander seeds. Remove the gherkins from the salt. Wash them thoroughly and dry them once again. carefully fill with the vinegar/water solution (gherkins should be covered) and seal. Set aside at room temperature for three to five days before eating.